Germantown, Wisconsin has a small-town rural atmosphere, but its easy access to Milwaukee offers suburban amenities that attract many newcomers. The residential and business growth of the area has been steady, allowing this unique community to maintain its rural charm and distinct German heritage. A major concern of the community was the need to remove radium from its potable water source and bring the water treatment plant into compliance with current USEPA regulations. After consultation with Ruekert-Mielke Engineering, the village chose the Hydrous Manganese Oxide (HMO) radium removal technology offered by Tonka Equipment Company. HMO is a chemical that can be fed into the raw water that binds with radium. The HMO/radium particle can then be filtered through a conventional pressure or gravity filter. 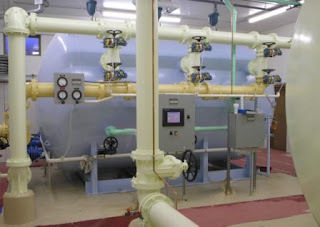 There are several issues to consider when designing a plant utilizing HMO for radium removal. A crucial factor involves achieving uniformity and precise solution strength of the HMO chemical solution. Even slight inconsistencies can affect the quality of the finished water. To alleviate the problems associated with non-uniformity of the HMO solution, Tonka developed a NSF-approved, preformed HMO chemical solution called TonkaZorb™ that is available in bulk shipments for delivery directly to the water treatment plant. Using a pre-mixed HMO solution also eliminates the need for on-site mixing of chemicals, improving overall plant safety. 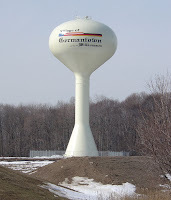 The people of the village of Germantown can be assured that they have excellent water quality and the most current and efficient technology for removing radium from their water source. TonkaZorb™ undergoes regular quality assurance testing to ensure correct solution strength, particle sizing and solution stability. Using the pre-mixed solution saves labor costs and simplifies the operator’s job. A properly engineered HMO feed system allows for trouble-free feeding of TonkaZorb™.